Today was smokin' hot here in Minnesota. It was one of those days I absolutely crave during our arctic winter months. I love flip flops, tank tops and feeling sweat stream down my face. I love popsicles, squirt guns and dirty bare feet. It seems like just about every week in the spring/summer there is an opportunity to throw together a quick salad for something or another. A birthday party, holiday gathering, play date. My stepmom sent me this recipe a few weeks ago and I've had it sitting on my kitchen counter because I knew I'd be making it soon! My little boys and I are in the middle of a very fun and long adventure. It began nearly a week ago. Since last Tuesday, we have visited six states, we have driven 1,396 miles in our old, trusty little car and we have met/reunited with 24 people. We are not even halfway done! We have so many adventures yet to experience before we head back to Minnesota. This is Week #33 of my 2011 cooking challenge! Click here to view all recipes from this challenge. All recipes created for this challenge come from the Food and Wine Annual Cookbook 2010: An Entire Year of Recipes. I'm not gonna lie. This week has been a tough one and it has left my head spinning. 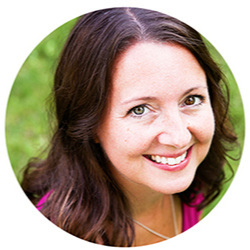 So tough that even food blogging is a challenge for me, which is saying a lot because cooking and blogging about food happens to be one of my favorite things in the world. So I was pleased to see an easy recipe on my challenge list for this week. Easy and delicious...even better! Once I made it, I kind of fell in love. I want to put this dressing on everything! And now I'm encouraged to make more of my own salad dressings. Who needs Paul Newman?! Pulse until smooth and season with kosher salt and pepper. Drizzle over a salad or grilled veggies. I can imagine this to be delicious drizzled over just about anything. 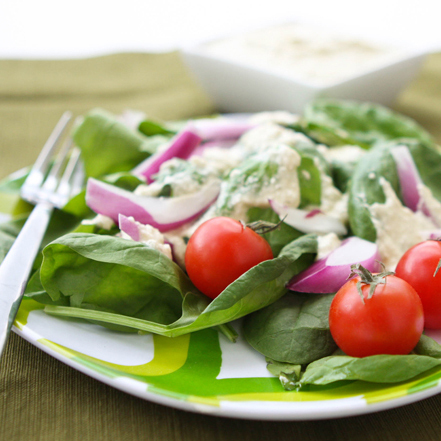 It is one tasty, creamy little dressing. 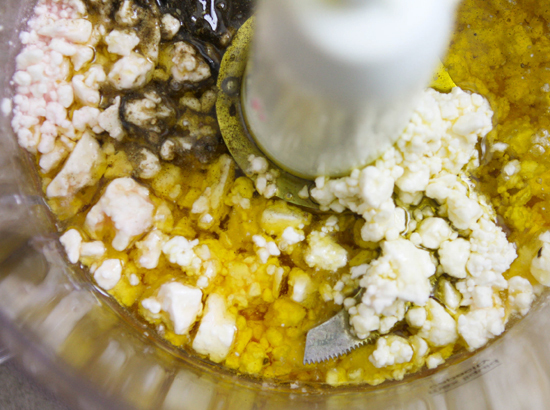 In a food processor, pulse the crumbled feta with the vinegar, water, oregano and oil until smooth. Season with salt and pepper. This is a great toss and serve recipe! Loaded with flavor, lots of crunchy vegetables and juicy ingredients helps make this a full meal with chicken. Chopped basil and mint highlight all the vegetables. 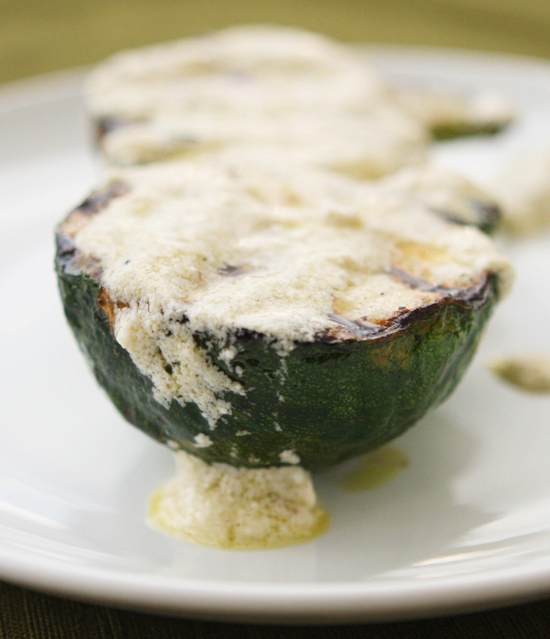 This light dressing doesn’t drown out the ingredients either, so enjoy! I made this chopped salad on Sunday and I have had it for lunch every day since. Well, except for yesterday when I met my husband for sushi only to return to work to find that roasted chicken, glazed carrots and mashed potatoes had been brought in by the company. My intention was to take just a teeny sampling of the food because, goodness, I had just eaten lunch. But my "sampling" turned into an entire heaping plate of food, which I had no problem stuffing into my face. Then someone said to me, "You have to try the carrot cake!" I do? Ok. So I tried the carrot cake. And then my belly hurt until dinner, which I wasn't at all hungry for. 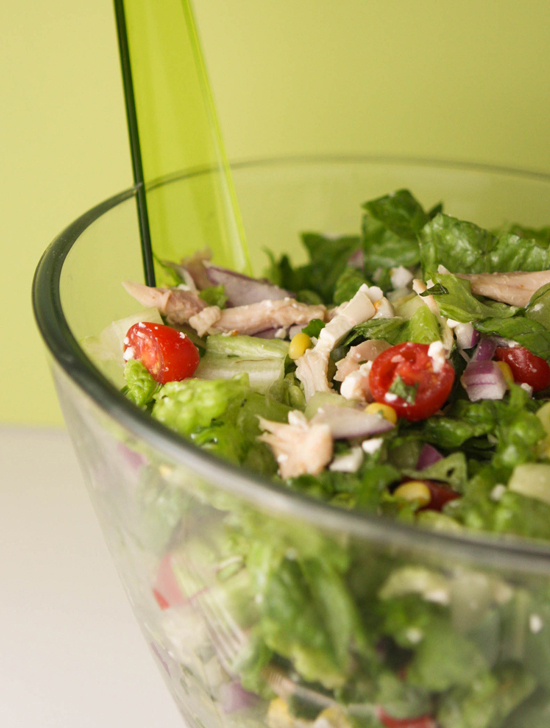 Chopped salad is famed from back in the 1960’s over in Los Angeles when it became quite the thing to have a salad chopped - meaning the salad and all its ingredients are now cut into tiny, fine pieces. The idea is that each bite is filled with all the flavors of the salad, you aren’t missing any. 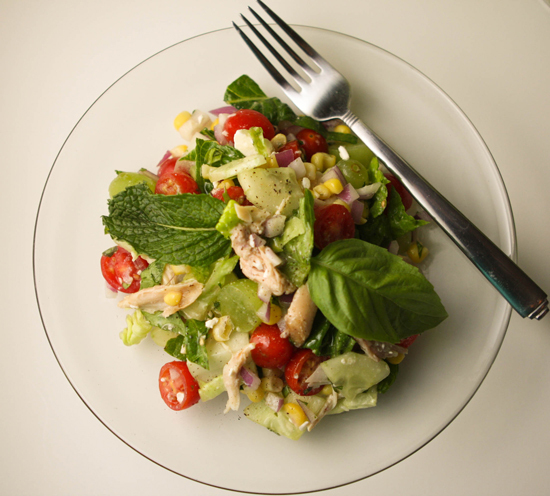 Chopped salad today doesn’t always mean that it’s finely chopped, because, to each his own! Does a chopped salad have specific ingredients? Nope! 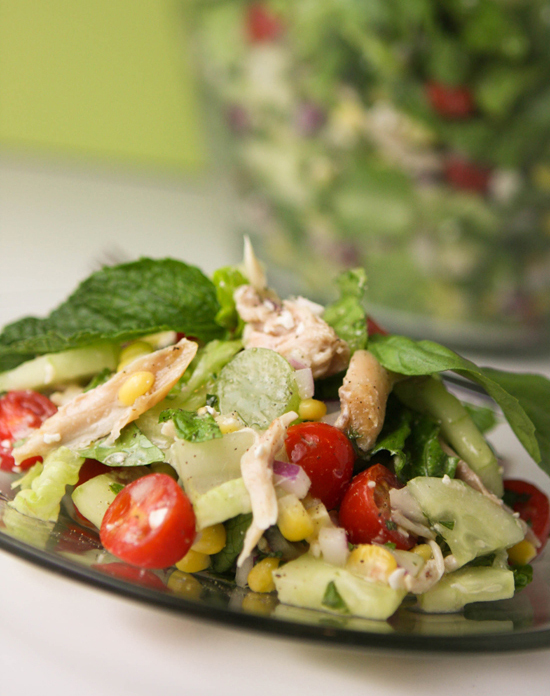 A chopped salad can consist of whatever proteins, vegetables and dressing you desire. There’s no limitations, it just suggests that any ingredients selected are cut into bite sized pieces so each bite is flavorful. So aside from that ridiculous double-lunching day, I have been enjoying this salad for my lunches all week. It's the absolute perfect lunch, packed with flavor and nutrients and it didn't leave me feeling either hungry or full. I'm pretty sure I emptied the salad bowl this morning, so tomorrow I'll be back to Ramen noodles. Wooo. By the way, I combined the ingredients for the dressing separately since I knew I would be eating the salad over the course of a few days. I loved it! Totally delicious! In a large bowl, toss all of the ingredients together. 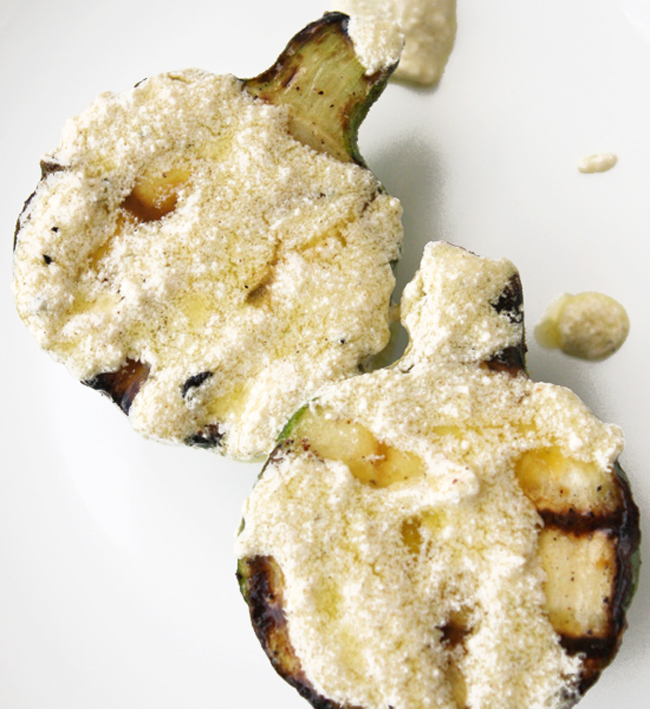 Season with salt and freshly ground pepper and serve immediately.